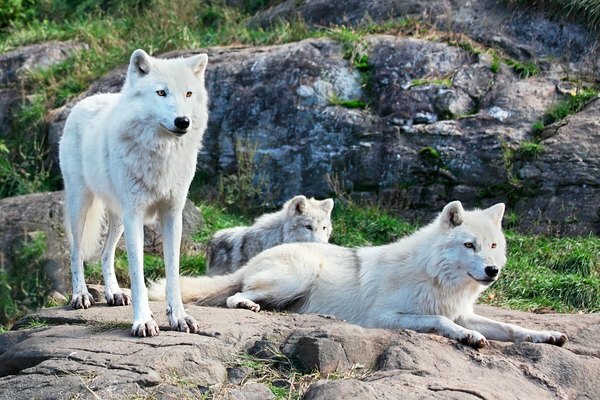 What Is the Difference Between Gray & Timber Wolves? Only two distinct species of wolf exist in the world: the gray wolf and the red wolf. The timber wolf, like the Indian wolf, the Himalayan wolf, the Mexican wolf and the Arctic wolf have long been considered subspecies of the gray wolf. Over time, however, opinions have become divided on whether certain subspecies are, in fact, species in their own right. The timber wolf is one of those subspecies. The gray wolf is the largest wild canine on the planet. It typically weighs between 50 and 100 pounds. Males and females differ in size, with males being the larger of the two sexes. Male wolves usually stand between 27 and 33 inches at the shoulder and measure between five and six feet long. The wolves are referred to as the “gray” wolf, but their primary coat color is intermingled with tan, cinnamon and black hairs. Some gray wolves may also be brown, solid black and white. Their fur is rough and shaggy, forming a short mane over their shoulders and a brush-like tail. The Michigan Department of Natural resources describes the eastern (timber) wolf as being “smaller and less stocky than the gray wolf." These differences may exist because, while the eastern wolf is considered to be a subspecies of the gray wolf, the latter wolf is also considered to be a kissing cousin of the coyote. 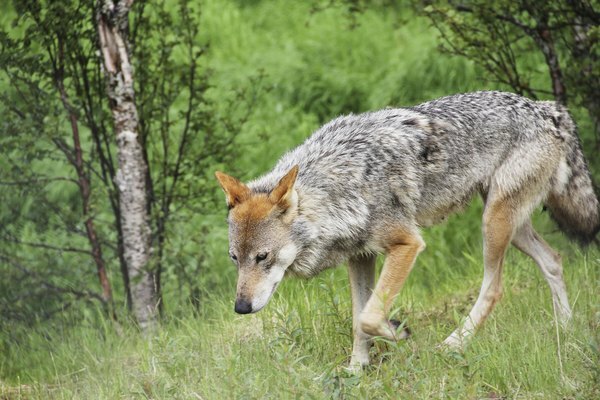 Hybridization is common between the coyote and the eastern timber wolf. 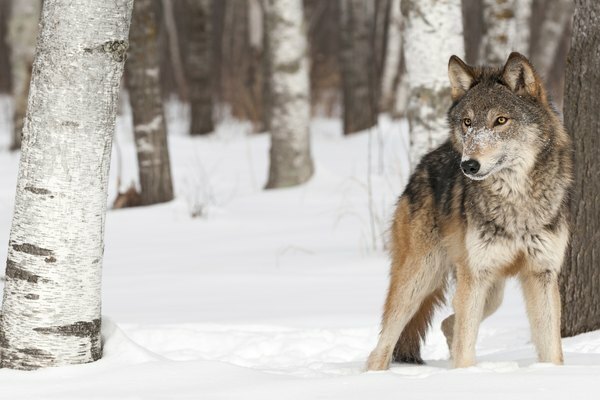 It is so common, it can be argued that the eastern timber wolf might not be a separate species or subspecies, but that the genes identified as belonging to the “eastern timber wolf” might actually belong to the coyote instead. The eastern timber wolf and the gray wolf share most wolf-related physical characteristics other than size and the timber wolf's slightly lighter build. According to the Department of Environmental Conservation, gray wolves “originally occurred over much of North America, ranging from the Arctic in the north to the middle of Mexico in the south.” Their range did not extend into the American southeast or into North America’s desert regions. 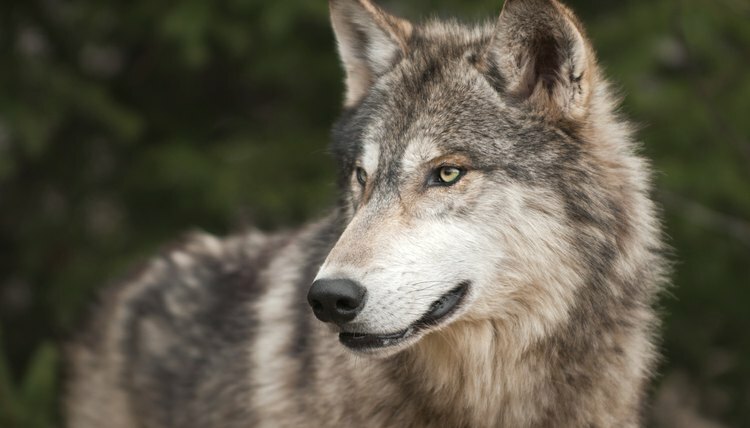 The timber wolf inhabited the eastern United States. Both the gray wolf and the timber wolf inhabit only a small percentage of their original United States territory. Both gray wolves and eastern timber wolves live in packs consisting of two or more individuals. These packs may consist of up to two dozen members. 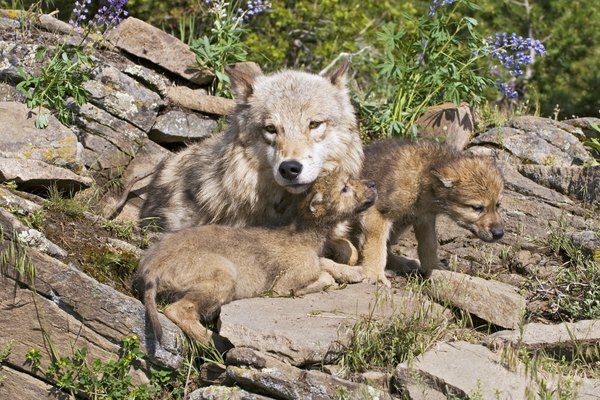 Wolf packs usually consist of only one breeding pair, their offspring and other wolves with which they may share a family relationship. Pack ranges may extend over hundreds of square miles. Gray wolves and timber wolves typically hunt and consume different prey animals, due to their respective ranges. The gray wolf typically consumes caribou, elk, moose and white-tailed deer when hunting as a pack. The eastern timber wolf typically has access to only white-tailed deer over most of its range; however, it does hunt moose when available.